Today feels a bit like a “cheat” again–I mean: how can I say “climb” is an “experiment in living simply” when I spend at least two nights a week at the gym climbing–and if given the opportunity, would spend most weekends doing the same thing outdoors? I suppose it’s because of how we climbed today. We met up with some friends, hiked in, found a few lines to climb, and then settled in for the day in one spot. No projects. No lining up for a turn on a “classic” route. No last gasp push to get a final climb in before dark. It was just a mellow day at the crag. I also didn’t sweat it that my two youngest kids decided they would rather just play around in nature instead of putting up any climbs. That was perfectly fine with me today, and I think everyone had a better day because of it. I even had fun on my fail for the day. After multiple attempts to get past the third bolt on Twist and Shout, I had to bail and let my son take the lead. I’m not entirely sure why climbing is so satisfying for me, but it is–especially outdoors. Sure, there’s some adrenaline addiction to it, no doubt. And then there’s also the father-son thing as well, since I’ve done almost all of my outdoor climbing in the company of my oldest child. But I think it’s also the fact that climbing forces me to be present and to be in my body–in the moment–in ways that few other activities can do. I look down, hear the sounds of the things you said today. There are so many reasons why today could have been frustrating. I could have been struggling against my kids. I could have been rushing from route to route. I could have shut down after having a decent lead fall or failing to send a route that–in my head at least–I should have been able to send. Instead, the day just felt right, no matter what happened, and I truly appreciated it. And sure, it always feels pretty good to be “above the treeline and the clouds”–if only for a few moments–before being lowered to the earth again. This entry was posted in Uncategorized and tagged being present, family, nature, risk, simplify. Bookmark the permalink. No problem at all. I’m grateful for those other falls too–I absolutely needed them. And of course: thanks for keeping me from getting hurt! Not to rub it in, but it’s been a late start this year. 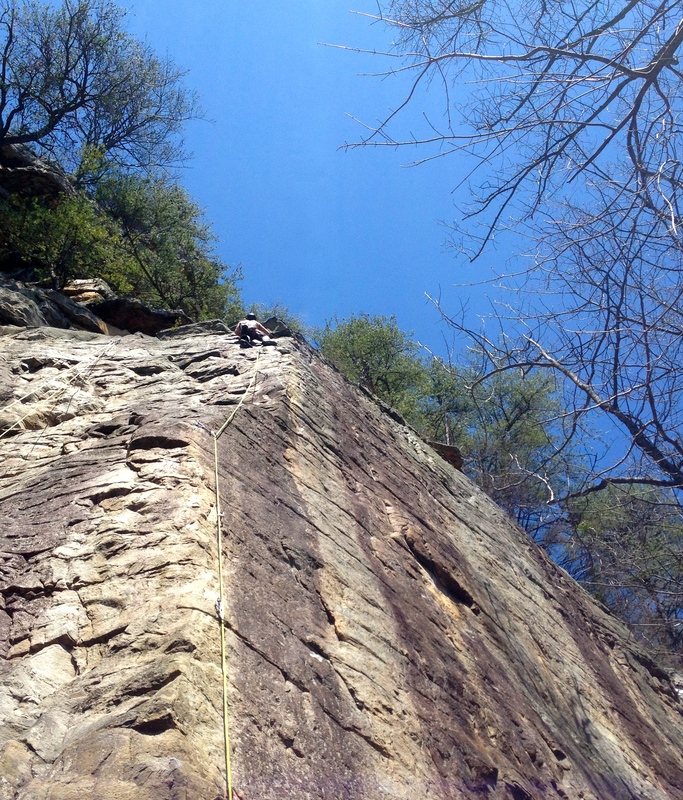 🙂 One of the best things about living in the south is that with the exception of a few weeks, there really is year-round climbing.